Searching for a professional translation company? Traduspanish is a professional translation company that provides a full suite of high quality professional language services in over 15 languages to enable you to communicate accurately. Our professional translation services are undertaken by native, highly qualified professional translators with expertise in your chosen subject or industry sectors: Technical Translation, Legal Translation, Financial Translation, Marketing and Tourism Translation, and Website Translation. 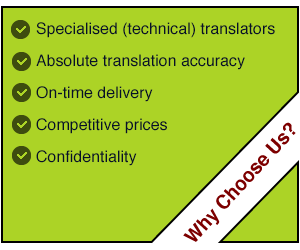 We guarantee a consistently excellent quality of translation services in each of these various fields by making sure we assign every document translation to the most appropriate specialised team of highly qualified translators, proofreaders and editors. "For every project, from technical translation to event interpretation, your message will remain clear and you will be represented professionally." We serve clients worldwide, so wherever you are based and whatever your requirements, you can trust our team to provide a reliable, timely and cost-effective service. We provide professional translation services from any language into Spanish and vice versa. With English to Spanish translations in particular, a deep understanding of the Spanish language and culture is necessary for the translation to convey the message accurately. In most cases, our clients need their documents to be widely understood by all Spanish speakers. That is why the translated texts are delivered in Neutral Spanish. However, our team will help you decide if it's better to localise your translation to a specific dialect. We are more than just a translation company. We bring the world closer to you. English, Spanish, Catalan, Italian, French, Portuguese, German, Russian, Ukrainian, Norwegian, Swedish, Danish, Japanese, Chinese, Greek, Dutch, Polish, Arabic and Romanian. We provide translation services in Bath, Belfast, Brighton, Birmingham, Bristol, Bournemouth, Cambridge, Cardiff, Dublin, Eastbourne, Edinburgh, Galway, Glasgow, Ipswich, Leeds, Leicester, Limerick, Liverpool, London, Manchester, Newcastle, Norwich, Nottingham, Oxford, Plymouth, Sheffield, Swansea and York, among many other cities.